Wedding gown with lace bodice and three quarters sleeves in ivory/white. 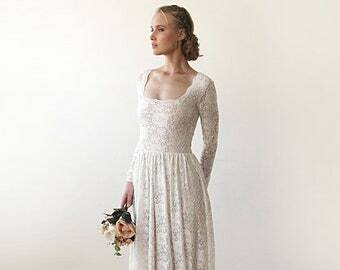 The wedding dress has a modest yet vintage style, floor-length hemline, delicate v-neck, and is carefully crafted using the finest soft lace. A refined and classic fit designed for style, comfort and form. 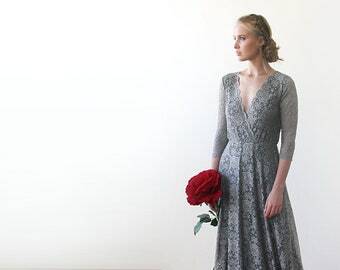 The maxi lace wedding dress is graceful and is a timeless wedding gown. Ivory Lace Long Sleeves Wedding Dress, Tulle and Lace Bridal Gown, Long Sleeve Wedding Dress, Tulle Wedding Dress empire 1125. Je l'adore ! La robe s'adapte parfaitement à ma morphologie. Un grand merci à blushfashion ! This dress was beautiful! I ended up picking another one for my wedding day- but it was stunning! Okay, so the dress itself is beautifully made. I selected a custom order to have the back opened up but when the dress arrived that detail had been missed and there were 2 small holes in the waist seam. However, I would not hesitate to order from blushfashion again. The customer service and communication has been outstanding. They offered to make me a new dress but I didn't have time due to my wedding date. Shlomit has been amazing to deal with. They made every effort to rectify the minor issues I had and from other reviews I know that my experience is not the norm. The dress is so beautiful and well made, I highly recommend ordering your dress from the ladies at blushfashion. I was skeptical about ordering my dress online from another country, but after scouring through hundreds of 5 star reviews I decided to go for it. I got the dress on sale and had it custom made to my specifications with full length sleeves and it could not have turned out more perfect! Communication was always super fast even considering the time difference from the US. I sent in my measurements and the dress was made and delivered in about 3 weeks, which was so much faster than I had expected. The fit was perfect, the material is beautiful and really comfy and stretchy. It was the perfect dress for my mountaintop elopement, thank you so much BlushFashion! We will be happy to make you a custom made dress. Please contact us regarding special requests to hear all about the conditions. Looking for new stylish designs to sell on your boutique? Let us know! We will be glad to discuss your needs and vision. What should I do if I want to purchase more items than the quantity in the shop? Please contact us and we will add the stock for you or discuss a custom-made order. Items will be ready to be shipped within 3-6 business days after PayPal payment is complete- Unless the item is "custom made" or out of stock. Shipping is made from Israel by standard-registered mail (include tracking number) and delivery can takes 7-14 business days to Europe, Canada, Australia and overseas. Delivery to USA can take 7-10 business days to arrive. How long is express shipping with DHL? all express orders are sent with DHL express service. Fee and taxes may be charged upon delivery. This is the receiver responsibility and we have no control over it. You accept returns and refunds? Custom-made orders and items from Crazy Sale collection can't be replace or refund. All other returns, please contact before you want to return in order to get full instructions. All return order have 10% restocking fee. You will be refund for the value of the item, not include the shipping charge you paid. The return cost of any item is at the expense of the sender. Please make sure to include the invoice or your details in the package so we can connect it to your order. unnamed packages will not be refunded.